How to Recycle Your Makeup! Something didn’t really sit right with me when it actually came to throwing out the products – I knew there was nothing I could do with them since they had expired, but the guilt/cringe of throwing out something was still there. Throw into the mix the fact that apparently personal care and beauty products account for a third of all landfill waste and that we discard our own weight in packaging every 30-40 days, and you’ve got a fully a fully-funded guilt trip – vroom vroom! Now I don’t pretend to be a zero-waster of any kind or anything, but I think I can definitely make more of an effort to be a lot less wasteful in general. It was right around this time that I came across a video by Shelbizleee on YouTube (who I spoke about before when I discussed the New Consumerism) on how to recycle makeup and cosmetics and take apart eyeshadow palettes. I thought that recycling these old/expired products might be a good way to ease some of that guilt and I figured I would share some of her insight and then do some other ~probing~ on good ol’ Google like the millennial I am! @2:47 – Shelbi uses a Morphe palette as an example and takes it apart to show all the “components” that make up the palette. She first takes off the clear lid, which she thinks might be made out of acrylic and not all curbside recycling takes that kind of plastic. @3:18 – She pops out all the eyeshadows and then shows the second layer of plastic that they were sitting in (as seen above), saying that she thinks it’s plastic #5, a very thin plastic that is usually very difficult to recycle and usually can’t be recycled. She says this kind of plastic is only used once and if you can avoid this kind of plastic, you should try to do that. @4:31 – She removed the thin plastic layer (plastic #5) from the bottom layer, which she says she assumes is made out of plastic #1. This kind of plastic is much more easily recycled and should be separated from the other plastic as they should go into separate compartments in the recycling process. @5:53 – She provides more options to recycle for people who don’t actually want to deconstruct their palettes. The first option is Terracycle, an organization that takes things that can’t usually be recycled in curbside recycling; she says it seems that you have to be a large collector in order to send to them directly, but that in some locations there are drop off bins to put your items in. The second option is Origins, which is a skincare company that she says apparently will accept packaging from any makeup brand or company if you go up to one of their counters and they will recycle it for you and that if you’re a customer there they’ll actually give you some points for their rewards program. Before I jump into some of the other stuff I found through some more digging, I thought it might be helpful to go over some of the numbers Shelbi was referring to when she was talking about plastics. Eartheasy has a guide on “plastics by the numbers,” which I found really helpful and tells you which plastics can and can’t be recycled because not all plastics are recyclable, which is why Shelbi was saying that she was separating all the different plastics from the palette she took apart to recycle them correctly. #1 (PET) – found in soft drink bottles, water bottles, peanut butter jars, salad dressing, cooking oil, many cleaning products. Greenopedia also remarks that even the plastics that aren’t often accepted for recycling are stamped with the recycling symbol as some plastics can actually contaminate the recycle stream, which I didn’t know about previously. If you throw non-recyclable plastics into the bin, they have the potential to contaminate the entire stream, causing manufacturers to either pay less for the contaminated plastics or to just not buy them at all. The website also offers some “good to know” tips, such as the fact that if plastics don’t have a code, it’s probably safest just to throw it in the trash to avoid contaminating the stream and that it’s also always a good idea to rinse the plastic before recycling it. As Greenopedia says, if you don’t know what type of plastic something is for sure it’s safer just to throw it away to avoid contaminating the recycle stream, but if you’re ever curious as to what kind of plastic might be making up the different types of products you have, a company called Raepak published the types of plastics used in the packaging that they manufacture. 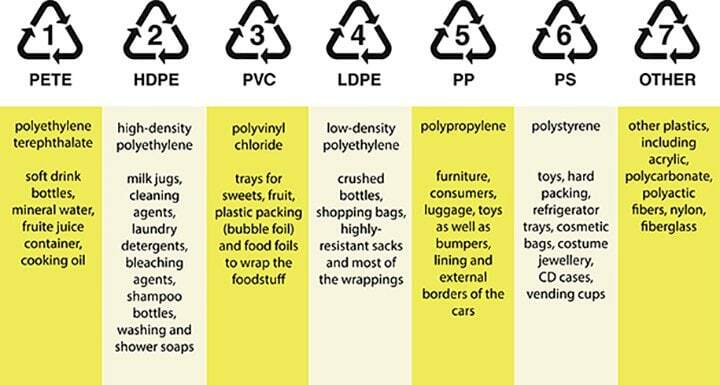 Granted, this is specifically information pertinent to them so other manufacturing companies might be using different kinds of plastics for different products and you should still follow what Greenopedia says and not take this as the ultimate guide, but I thought it was interesting! Raepak // PLASTIC PACKAGING – WHICH PLASTIC FOR WHAT PRODUCT? Also… I just appreciate the fact that they put this information in tabular form already for easy consumption. Ok, moving on. Beautiful With Brains // HOW CAN I TELL IF THE PACKAGING OF MY COSMETIC PRODUCTS CAN BE RECYCLED? This means that an object can be recycled, but not that it will be accepted by all recycling plants. When the symbol includes a %, followed by a number, in the middle, it means that the packaging contains only that percentage of recycled material. This symbol doesn’t tell you if a container can be recycled, but only that you should dispose of it carefully and thoughtfully. This symbol can be seen on the packaging of products sold in European countries and signifies that the producers and suppliers have made a financial contribution towards the recycling of packaging. But it doesn’t mean that the container itself is made of recycled material or that it can be recycled. The tl;dr on this is that all plastics have different numbers and some can’t even be recycled. In this case, you definitely should be separating your plastics to avoid the risk of contaminating the whole recycling stream! When it comes to cosmetic products, some have nifty little symbols on them that designates if they’re recyclable or part of a recycling program, but if they’re not numbered and there’s no way of telling what kind of plastic they are, you should just dispose of them normally to avoid that risk of contamination that I keep talking about. Check your plastics for numbers and separate them appropriately as not everything can be recycled. Also check for symbols, such as the Mobius Loop, Tidyman, and Green Dot to see if the packaging is part of any recycling program. When in doubt, throw it out to avoid the risk of contaminating the recycle stream. To ensure that you’ll be able to recycle something moving forward, try to buy from companies that already have recycling programs in place, or even better – buy from companies that have alternative packaging that won’t product waste in the first place. Phew! Who knew there was so much to recycling? Time to take a swig from my (zero-waste) water bottle! Take a f****** sip, babes! Greenopedia // Which Plastics Can or Cannot Go In The Recycle Bin? Here’s Your Quick List. Thank you for this post. It was such a good read. I always wondered what to do with makeup that was expired that I was just going to have to throw away. I make the same piles when I declutter, one for friends if the product is fine, and one that unfortunately has to go in the garbage. I love that a few brands have set up their own recycling programs, I hope other brands get on board soon. Thank you for this!! Reblogged! !